Upon first glance, you can easily observe the similarities between my three children: they are all petite with small heads and big eyes…as funny as it sounds, it’s true! However, their personalities differ from one another, as does everything else including their sleeping patterns! 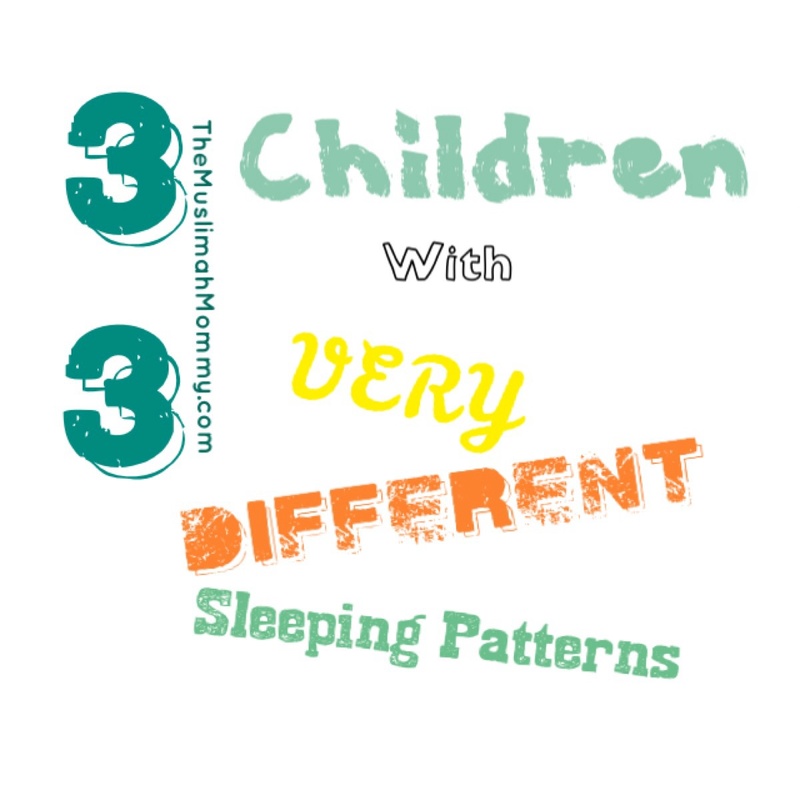 Down below are each of my children’s sleeping patterns in addition to tips to help your little one sleep. My oldest daughter was one of those babies that HAD to sleep with her parents. She needed to feel the warmth and the comfort of being with her parents, and slept in my bed until she was about three years old. I have to admit that I did attempt separating her from my bed, but she resisted; and the only way she would actually fall asleep (and stay asleep) was if I was near her. Eventually I gave up trying to get her to sleep in her crib, and I must say that I actually enjoyed the bonding experience with her…but I also learned that a queen sized mattress was a huge mistake – we should have bought the king sized one! My second daughter, was the best sleeper EVER! She would only wake up for her feedings as a newborn, and then fall right back asleep IN HER OWN CRIB THAT WAS IN HER OWN ROOM – this obviously was wonderful after having to sleep with my oldest daughter for three years prior! From the very beginning I put my second child on a routine that consisted of a bath followed by a bottle feed and cuddles. The interesting fact is that I implemented this same routine with my oldest daughter as well…which makes me assume that most (not all) first born’s sleep with their parents despite efforts to make them sleep alone. By the way, I did ask some of my friends and family members if their first born’s slept with them as babies, and they all answered yes….hmmmm…interesting! My son was (and still is) the worst sleeper to date – sigh. Although he has slept in his own crib and in his own room since he was just months old, I have found myself transferring him back and forth to my room and back to his room – All. Night. Long. The issue we have with our son is that he prefers to sleep in his crib, but he continuously wakes up through the night, and he is not comfortable sleeping in our bed- hence going back and forth all night long. One method that I did find to work was the ‘patting technique,’ which you can read all about below; I also found that giving him a special blanky helped comfort him at night. Finally, we kept a food diary, and through that we found out my son had many food sensitives that caused him to have severe eczema. Once we eliminated those foods from his diet, my son started sleeping better. I’am finding that as he gets older, he is sleeping for a longer duration of time, as well as waking up less frequently, so I’m hopeful that he will have this sleep thing figured out by the time he’s three. It’s funny because when I express my hopefulness to other mothers in the same situation as me with older kids, they just laugh – SOMEONE HELP ME! Establish a Routine – Routines help babies predict when it’s time for bedtime and help them get relaxed. An example of a routine would be giving your baby a bath, followed by a massage, a feeding, story time and cuddles. Cut Out Stimulation – Try to get your baby relaxed, not excited. Reduce screen time (ie tablet games, t.v) and avoid bright lights prior to bedtime. Use Comfort Items – Try giving your baby a special blanket or stuffed toy for comfort during bedtime. Patting Technique– I tried this with my son and IT WORKED! To get my son to fall asleep I would him in his crib and pat him very gently. Slowly, I would stop patting him and just lay my hand on his chest until he would fall asleep. Once he fell asleep, I would remove my hand and place his blanket where my hand was. Reassurance– If your baby or toddler is waking up throughout the night, go into the bedroom and reassure him or her that you are nearby; giving your baby or toddler lots of hugs and kisses during this time helps as well! Right Temperature– Babies will sleep better at the right temperature. Your baby should be warm enough, yet not overheated. Try avoiding excess layers, and make sure your baby’s body is covered enough to provide warmth. Onesies and sleeping sacks are ideal! Adjust The Mattress: Acid reflux is a common issue in babies, and leads to discomfort for babies while sleeping. You may want to slant your baby’s crib mattress at an upwards angle to help with acid reflux during the evening. To do this, simply put a rolled towel under the mattress where the baby’s upper body will be. Noise Machines – The soothing sound of a noise machine has the ability to help babies sleep throughout the night. With that said, I have not used a noise machine for any of my children, however I do know parents that swear by them! Night Light– Some children may be scared of the dark, so having a night-light could be helpful. Eliminate Naps– Eliminating naps, or reducing the duration of a nap, may help some babies and toddlers sleep better at night. Timer & Clocks– For older children, a timer or special clock may be effective for keeping them in their bedrooms until morning time. Often, toddlers may wake up in the middle of the night thinking it’s time to wake up, but having a clock that lights up when it’s wake up time helps them to distinguish between night-time and morning time. Sticker Charts– Rewarding toddlers with a sticker each time they sleep through the night might do the trick for some little ones! Check for Medical Issues – Common issues for babies that may prevent them from having a good nights sleep are food allergies or sensitivities, constipation, gas, eczema, or teething. You may also want to check to see if the formula you are giving your baby is causing any discomfort, or if your diet while breastfeeding needs any adjustments. Melatonin– Some babies may be low in melatonin, and therefore these babies may need a melatonin supplement to help them sleep. Please note, melatonin should only be given to those babies who need it, and not to babies that are have acceptable melatonin levels in their bodies already. Co-Sleep: Sometimes, babies just want to be close to their parents and caregivers, PERIOD. If you have tried every technique and nothing seems to work, except for co-sleeping….then co-sleep! Co-sleeping has been successfully practiced for many years, and if practiced carefully, can have great results. Of course, you have to be aware of SIDS (sudden infant death syndrome), and take measures to prevent the risk of SIDS such as quitting smoking and not drinking alcohol prior to co-sleeping. If you don’t feel comfortable with the idea of co-sleeping, then you may want to consider putting a bassinet (or crib,playpen) in your own room so you can still be close to your baby. Don’t get upset if your friends children are sleeping throughout the night while your children are not – this has nothing to do with you and how good or bad of a parent (or caregiver) you are. Every child is different; I know this because my three children are VERY different from one another! Remember, you are a good parent and you are doing the best you can.